You never know quite what is going to happen at a wedding reception. I had done the getting ready shots, covered the ceremony, gotten the requisite formals and had finished the couple portraits. Now, it's time to combine, food, fun and dancing. There are certain songs that will almost always trigger a some kind of response during a reception, songs that everyone knows. Sometimes the response is low key and sometimes it's more off the hook. The theme song from "Dirty Dancing", the 80's movie featuring the late Patrick Swayze and Jennifer Grey, will almost always lead to one of these moments. Someone is going to do it, or at least try it. Yep, the lift! I have been fortunate to see some good ones, seen some fails and seen some that were in the middle. I was actually grabbing another shot when I caught the groom's sister running to the dance floor and simply swung the camera. And this is the result. You can see from the sister's reaction that the "lift" was a perfect combination of fun and awesomeness! 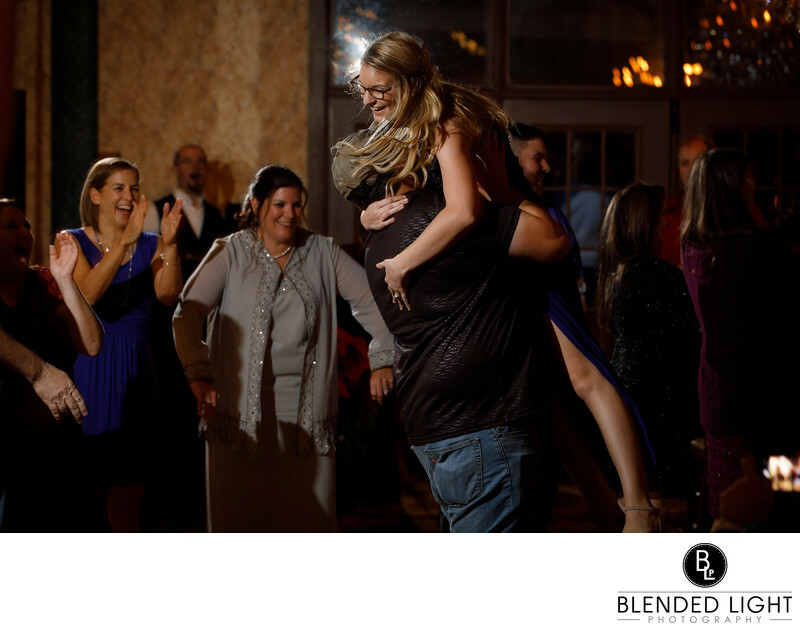 A great moment from the couple's reception, perfectly exposed for drama and detail. One of the things I stress to my clients is to get their guests involved in the wedding reception. Get them up out of their seats, get them moving, clapping, cheering, anything. That's when reception magic happens. This crowd didn't need the encouragement - they were on it on their own! In fact, the whole set of reception images were beautiful and really captured the fun environment that the bride and groom had envisioned and planned for! Receptions are loads of fun to photograph as everyone is being themselves. The formalities of the day are over, so guests are really cutting loose, talking, laughing having a great time. It is a wonderful time for dancing shots, but also a great time to create some of the causal shots with family and friends that did not fit into the formal session. The reception is a very candid time of the wedding day. This was the second wedding I have shot at the Preston Woodall House in Benson, North Carolina, just 45 minutes outside of Raleigh. The house is a 9500 square foot Queen Anne Residence with stunning charm and beautiful decor. It is conveniently located 1 mile from the interstate 40 and interstate 95 junction. In addition to the house, the property also owns several small cottages adjacent to the property for out of town guests or the grooms getting ready area. One of the greatest features of the House isn't the house itself - it's the staff. The staff is excellent in all areas, extremely vested in customer service and operates as a well-oiled machine with a very personal touch. Most ceremonies take place outside in the garden area with the bride and groom saying their vows under a covered area. The grounds are clean and well kept. it is a beautiful location for any event, especially a wedding, and a great venue for either small or larger weddings. 1/25; f/5.6; ISO 1600; 142.0 mm.